Tag line: "Are You Ready For The Truth?" M. Night Shyamalan’s Unbreakable is a dark, brooding look at the world of superheroes, a movie that sets out to explain how someone possessing such gifts might go about discovering their unique abilities. Bruce Willis is David Dunn, a security guard and family man who’s also the sole survivor of a violent train wreck. But what’s truly amazing is that, not only did David survive, he walked away from the twisted carnage without so much as a scratch! 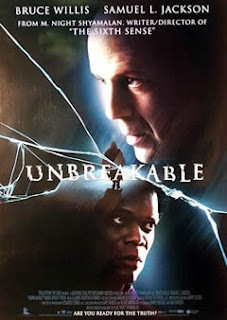 Soon after the crash, David is approached by Elijah Price (Samuel L. Jackson), who suffers from a rare disease that has weakened his bones, causing them to break easily. He offers David a possible explanation as to why he escaped the disaster unscathed. According to Elijah, an avid collector of comic books, David is actually a superhero, and therefore cannot be harmed. Skeptical at first, David slowly begins to realize he may, in fact, be someone quite special, a man destined to use his singular gift to help his fellow man. As with The Sixth Sense, Shyamalan once again visits the world of the incredible in Unbreakable, conjuring a fascinating reality in which super heroes dwell among us. Bruce Willis is decidedly understated as David, who, as the film begins, is very unhappy, trapped in what’s become a loveless marriage to his college sweetheart, Audrey (Robin Wright), sticking it out only for the sake of his son, Joseph (Spencer Treat Clark). As the story progresses, David unravels the mystery behind his true nature, which, in essence, brings purpose to his life. On the other side of the coin is Elijah, a weak and brittle man who, when not confined to a wheelchair, must use a walking stick to get around. Elijah is a no-nonsense character, a determined individual on a mission to convince David he’s not like other men, and Samuel L. Jackson conveys his resolute personality to perfection. Along with the performances of the two leads, there are a number of memorable sequences in Unbreakable, the best of which takes place on the platform of a Philadelphia train station, where David, coming to grips with his rare talents, finally puts them to the test. With his first three movies: The Sixth Sense, Unbreakable and Signs, director M. Night Shyamalan established himself as a filmmaker with a unique style and a fresh cinematic vision. And while I enjoyed The Village, his follow-up efforts, including 2006’s The Lady in the Water and The Happening in 2008, fell well short of the mark. There’s no telling whether or not Shyamalan will ever return to form, but after watching The Sixth Sense and Unbreakable again, I’m sure hoping he does! I should see this. I also enjoyed The Village (not a majority opinion, I think), and I very much liked Lady in the Water (not a good film, but a very interesing one). The interestng thing about The Village is that it was only after finding out the twist ending online that I saw it. Knowing the secret in advance didn't hurt at all.